Joining a small gathering of people in front of the iconic clock tower at the original Farmers Market on the corner of Third and Fairfax, I was introduced to an orthopedic surgeon and his daughter from Newport Beach, a mother and son from New Jersey, a young woman from the high desert, and a stylish public relations gal. We each received a Melting Pot Tours backpack as our hostess and guide, Diane Scalia previewed the highlights of our walking and dining tour. A history lesson of the area began while strolling to Bob’s Doughnuts for hot Ethiopian Blue Nile coffee and freshly baked donuts. 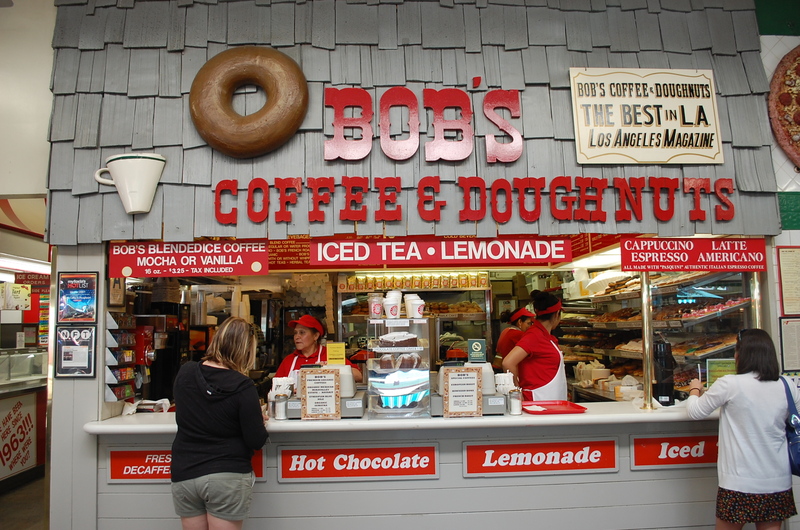 Bob Tusquellas bought the doughnut store forty years ago. Staff members arrive around 4 a.m. to make the fresh dough. After allowing it to rise for three hours, they churn out 1,000 doughnuts daily. While enjoying our sweet treats, Scalia informed us that in the late 1800s, the Farmers Market area was a swamp area rich with minerals and ideal for farming. The Gilmore family came here from the Midwest and purchased this land for a dairy farm. While drilling holes for water, they struck oil, and lot’s of it. They got out of farming and into banking, property management and oil. When the Great Depression hit, the Gilmore’s continued to prosper and in 1934 they allowed local farmers to park their trucks on the land for 50 cents a day to sell produce. They called this area Farmers Market and it became the local meeting spot for families. Nearby, Patsy D’Amore Pizza has been serving New York style pizza since 1949. Frank Sinatra helped them open the first pizzeria restaurant in Los Angeles. We admired the photos of Sinatra and the owners lining the wall. Next door, we met butcher Dan from Huntington Meats. Dan has become a bit of a celebrity with his recent debut as an expert on beef and various cuts of meat on Jamie Oliver’s Food Revolution television show. Adjacent at Monsieur Marcel, we explored the chocolate counter, olives from the Mediterran, freshly baked breads, wines and unique chesses with over 205 varieties from 15 countries. Caviar cheese is their most popular cheese made and packaged at this location. Topped with caviar, its a secret family recipe of creamed cheese and seasoned with smoked salmon. 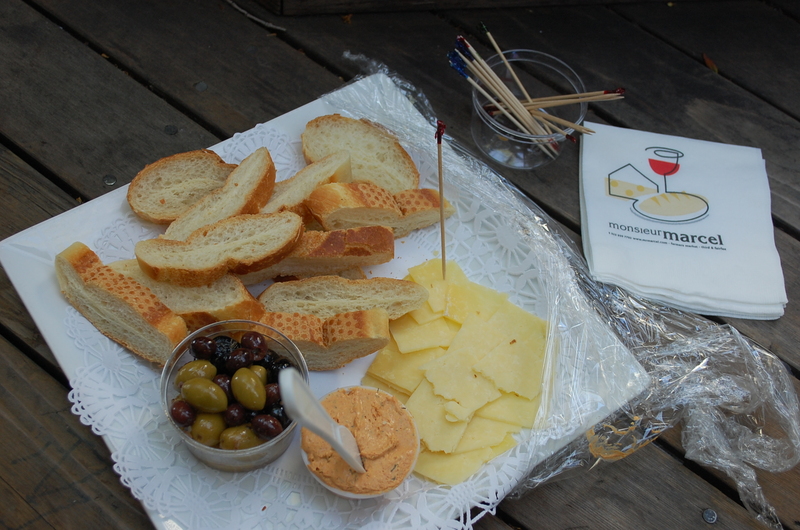 We sampled it spread on slices of baguette with some olives. Everyone agreed it was heavenly. 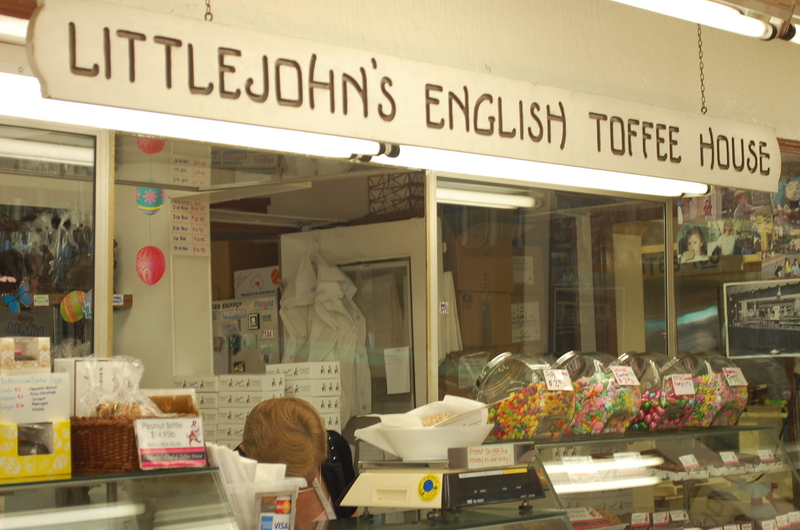 Little John’s English Toffee House has been at the Farmers Market for over 60 years. We sampled buttery English Toffee, while watching Mike the candy master make fresh toffee. Another highlight of the tour was to learn about Bill Thee’s champagne bottle cake with pink elephants. This was where the magic of frosting and decorating originated and the whimsical cake has become a sensation coast to coast. We admired the colorful produce at Farm Boy and Farm Fresh while biting into sweet strawberries as then moseyed over to at Pampas Grill Brazilian Churrascaria. 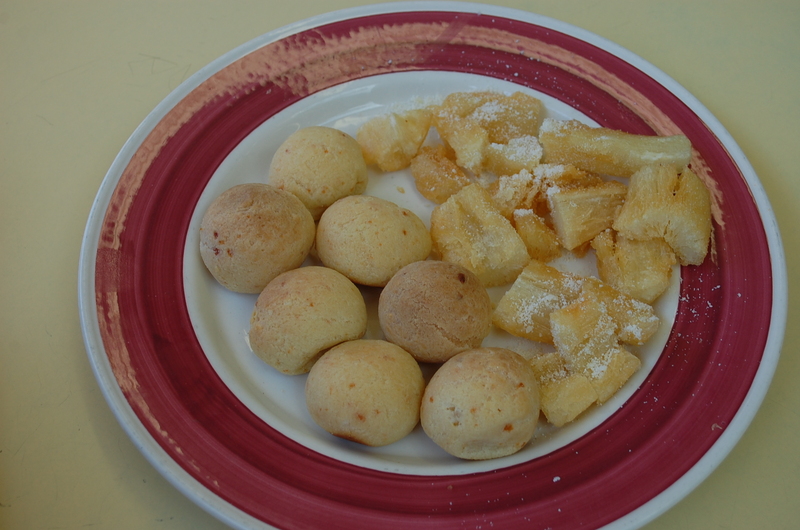 While sampling cheese rolls and deep-fried yucca sprinkled with Parmesan cheese (better than French fries) and a plate of grilled meats, Scalia showed us how to spilt the cheese roll in half, grab a piece of bacon wrapped chicken, Portuguese sausage or beef and eat it as a slider. Now I understand why there is always a line at Pampas Grill. One can enjoy a terrific meal for around $10 to $12. 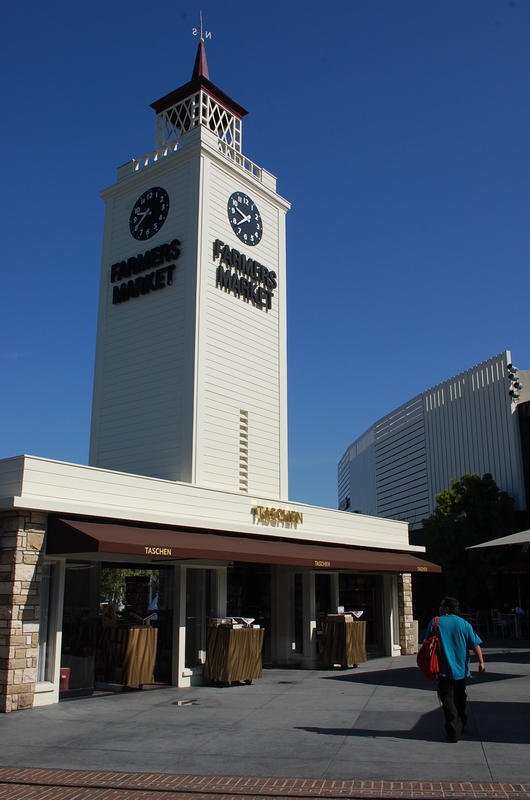 As we finished the Farmers Market part of the Melting Pot Tour, I developed a new appreciation for the landmark that has successfully been in the heart of Los Angeles for 77 years. It’s still and ideal meeting spot for families and friends to share a great meal and shop for fresh produce and specialty items. The Melting Pot Tours, not associated with the Melting Pot restaurants, is offering a special for Mother’s Day. In honor of moms, guests will receive $10 off their order for each two tickets purchased for any May 5 to May 8 tours. Just use promo code MOMS2011 when you book online or by phone. They also offer an Old Pasadena and Latin Spice tour. Go to www.meltingpottours.com or call (800)979-3370. Courtesy of the Beverly Press/Park LaBrea News on April 28, 2011 via Melting Pot Tours.